In June of 2016, the staff at Long Creek School began planning for a once in a lifetime total solar eclipse event, slated to occur on Aug. 21, 2017. 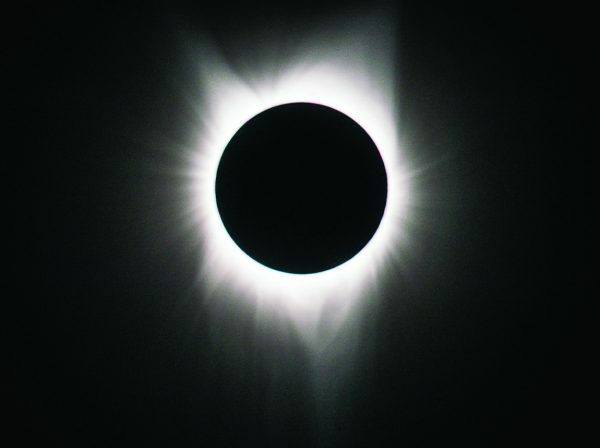 We knew that we were within the path of totality and realized that many people from around the world would be interested in witnessing this amazing phenomenon. The research we did told us that early estimates were to expect as many as 50,000 people coming to Grant County. Having a few of those visitors stop by Long Creek would be great! Long Creek is located in a large open valley in the high desert of the southern Blue Mountains on Highway 395. Our school grounds and facilities would be a perfect set up for an eclipse event. Eastern Oregon night skies are typically very clear in August with minimal ambient light. We contacted the school OSBA attorney about the feasibility and legalities for hosting a large number of people as campers on school property. After jumping through several hoops with the school board and getting approval for liability, the attorney gave us a green light for continuing planning. We had three main objectives. 1) Education opportunity; 2) Provide a safe, comfortable, welcoming place for our visiting guests to view the total solar eclipse; 3) Earn enough money to remodel and upgrade the school cafeteria kitchen and the school office to make both spaces safer and more user-friendly. Eric Sines, a photographer, 4-H Photography Club leader, and web programmer, set up a website with PayPal capabilities just for the eclipse. We mapped out the soccer field, football field and playground into large camping spaces. 4-H Photo Club members took photos on location for the webpage. Our site, named easternoregoneclipse.com, opened for reservations in January of 2017. As time passed, it became obvious that we were turning our Long Creek School campus into one giant classroom—we are, after all, educators! We wanted our students and citizens, as well as visiting guests to be scientifically educated about eclipses while having a relaxing and enjoyable experience. The majority of people who paid for camping spaces were families and serious eclipse enthusiasts. They saw spending their eclipse dollars on helping our school as a bonus. 9 Long Creek Education Association/ACE members involved in the eclipse, 100 percent of our membership! 200 Long Creek population when everyone is home! That sparked another idea…experts should be here at Long Creek School for the actual eclipse! We again contacted Dr. Cummings at PSU requesting eclipse experts. He agreed that it was a good idea, so Portland State University's Maxwell Rudolph, Ph.D, came to our school for the eclipse weekend to teach classes. We were also able to have Vincent Papol from the National Weather Service and National Oceanic Atmospheric Administration (NOAA), Tony Papol Astro a physics major from Brown University, the Wenatchee Star-gazing Club, and the Mission Western Eclipse French Astronomy Club here to join us for the eclipse weekend event. These experts helped with eclipse education, weather briefings, traffic reports, and identifying and viewing celestial bodies in the night sky. 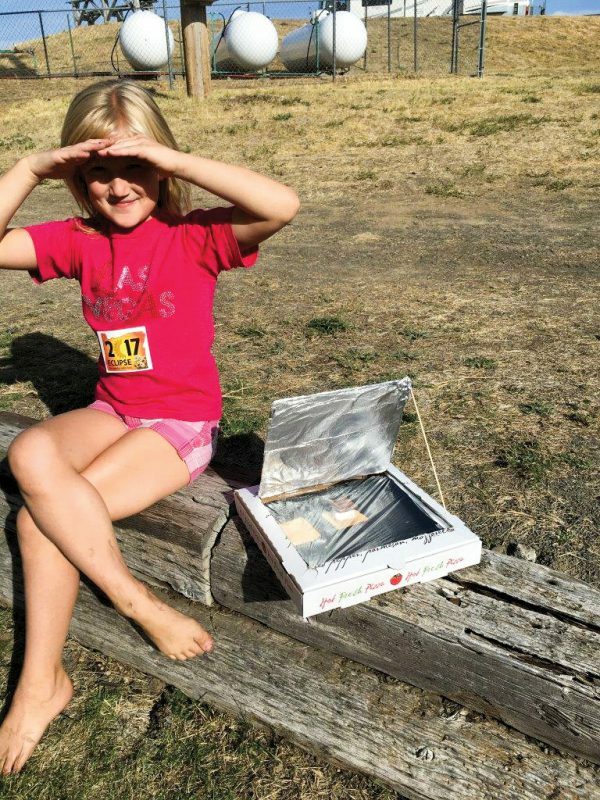 Long Creek student Jennifer Jones and her homemade solar oven - with a s'mores inside! We had several main groups of personnel and leaders who made this event possible. The Long Creek eclipse event encompassed much more than merely watching two minutes of eclipse totality. The event was a five-day celebration of people from many diverse cultures, countries and walks of life coming together to learn about, enjoy watching, and document what was for many, a once in a lifetime natural phenomenon. IT WAS COOL!